The Committee of KFCSA advise that the Association’s Annual General Meeting will held in the Park Suite at Rugby Park, Kilmarnock, starting at 2pm on Saturday 23rd June 2018. 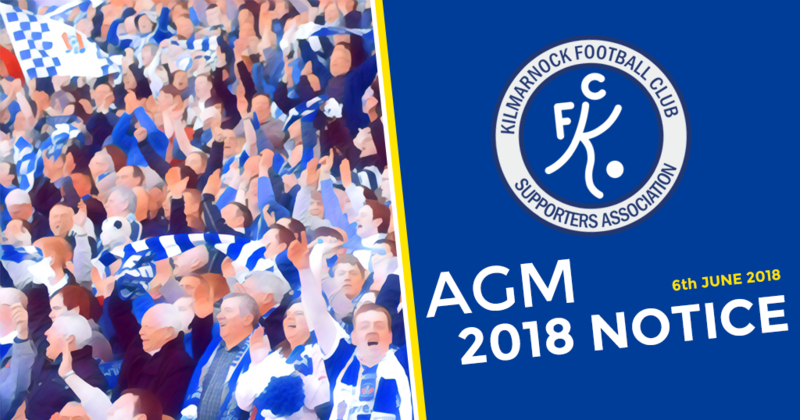 The current Chairman David Sneddon has indicated that he wishes to stand aside and does not wish to serve a second year as Chairman. Iain Sherry (the present Secretary) has been proposed for Chairman by Allen Kyle and seconded by Jim Thomson. Iain Sherry is resigning as Secretary. Terry McGarry has been proposed as Secretary by Iain Sherry and seconded by David Sneddon. Vice Chairman Allen Kyle and Treasurer Sharon Caldwell will serve their second year in their respective positions having been duly elected to serve two years at last year’s AGM. The Committee invite any other persons wishing to stand for the Committee to please submit applications to the Secretary Iain Sherry in writing with details of proposer and seconder no later than 13th June 2018.